In the 1956 World Series, an imperfect man pitched a perfect game. Last night, an imperfect umpire prevented one from happening. 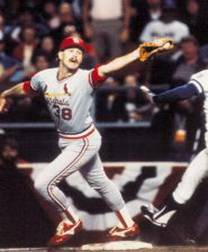 Jim Joyce's blown call in yesterday's would-be perfect game now rivals Don Denkinger's costly mistake in game 6 of the 1985 World Series. If you had not heard of Jim Joyce before last night, chances are you now have. Unlike his more controversial brethren (I am looking at you Joe West), Joyce has managed to have a rather anonymous 23-year career as an umpire, which is a good thing. Unfortunately, with one bad call, Joyce has now gone from unknown to infamous. Even though it occurred on the same night that future first ballot Hall of Famer Ken Griffey Jr. announced his retirement, Joyce’s blown call of the last out in Armando Galarraga’s would-be perfect game has reverberated around the sport, becoming one of the biggest stories of not only the season, but recent memory. What’s more, Joyce’s blunder will undoubtedly join, if not surpass, Don Denkinger’s infamous blown call on what should have been a ground out by Jorge Orta leading off the ninth inning of game 6 in the 1985 World Series. Denkinger’s erroneous safe call helped spark a Royals’ rally that changed the outcome of the World Series. Coincidentally, both Joyce and Denkinger worked on the same crew during their overlapping careers. Predictably, the response to the blown call has been to first lambaste Joyce, and then once again sound the drumbeat for expanded instant replay. After a spate of missed homerun calls during last season, major league baseball responded to increasing public pressure by incorporating the use of instant replay on boundary calls. The decision was quick, decisive and sensible. This time, however, baseball needs to be more deliberate lest it run the risk of going overboard. Lost in the furor of Joyce’s blown call was another costly umpire’s mistake from last night’s action. With the Mariners and Twins tied 1-1 in the 10th inning, Ichiro Susuzki hit a ground ball up the middle that second baseman Matt Tolbert fielded on a dive before flipping to JJ Hardy for what should have been an inning ending force out. Instead, second base umpire Dale Scott incorrectly signaled safe, by which time Ryan Langerhans was steaming around third with the winning run. Although Joyce’s blown call denied Galarraga a historic achievement, Scott’s miscue actually decided a game. Considering the Twins penchant for playing one game tie-breakers to decide the AL Central, that one game could prove very significant. Although the Scott’s blown call seems to bolster the case for instant replay that has been revived by Joyce’s mistake, it actually points out the number of potentially game changing calls that take place over nine innings. If baseball decides to enact instant replay, it must be prepared to deal with a number of resultant issues. After all, despite having instant replay for years now, the NFL’s system still is encumbered by many flaws. Unlike most sports, in baseball, the defense has the ball and the offense scores without it. As a result, instant replay in baseball can not simply follow the ball. There is too much simultaneous, dependent action occurring. For example, let’s take a modified version of the play that ended last night’s game in Seattle. With runners on first and second and one out this time, the batter hits a ball up the middle that the defense attempts to turn into a fielder’s choice. After the second base umpire rules out on the force, the third base coach instructs the runner to sprint for home, figuring it a worthy risk with two outs now in the inning. The alert short stop spots the attempt, however, and guns him out at the plate. Inning over. But wait, upon further review, it turns out the runner at second was really safe. Now, what do you do with the runner who was thrown out at home? Had the umpire originally called safe, the attempt would never have been made. It’s easy to construct countless examples of how instant replay could open up an even larger Pandora’s Box than one created by a blown call. I completely see what you are saying and I agree to a certain extent. However, there may be a way around your hypothetical, even if it’s not “perfect”. Like declining or accepting penalties in the NFL, the team that would normally benefit from the safe/out call (in the NFL, it would be the team that benefits from a penalty call) should have the option of accepting the call that benefits its team (this can become confusing; see below). So in your example, even if an incorrect out at 2nd base normally is going to disadvantage the hitting team, they have the option of letting the call stand if it led to something like you described above. It’s funny because the defensive team would be the only one challenging this play under the theory that if the runner was actually safe at 2nd, the runner at 3rd would not have gone. But the challenging team runs the risk of whatever else happens. Does that disadvantage the defending team? No, because players are required to perform based on what is the on-field ruling until proven otherwise (just like NFL or NHL replays; call on the field/ice stands until conclusive evidence shows otherwise). So if you are the defenders here and “out” is called at 2nd base (even if he’s really safe, to be shown later on replay), you are going to play as if he’s out. While at the end of the day the team on offense actually gains from the “out” call at 2nd, it is a stretch to say that a team that gets a particular call in its favor is somehow disadvantaged. What a third base coach or player “may have” done had the call originally been made one way or another is assuming that, even with the use of replay, umpiring will be perfect. The key is that it WILL NOT BE PERFECT, NO MATTER WHAT we do! The goal of replay should NOT be to make the game PERFECT, but to enhance the percentage of correct calls as high as is humanly and REASONABLY possible. Adding replay for close calls like this (only if a manager challenges the call, which he should be able to do once or twice a game) will probably add only a few minutes to each game if that but will greatly enhance the integrity of the sport. Here’s something else to consider. Before I begin, let me remind you that on a ground-rule double, a runner on first can only go to third, even if he assuredly would have scored had the ball not gone in the stands or been touched by a fan. It’s a statutory rule that the player is awarded third and the hitter second (the hitter may have even gotten a triple). While sometimes unfair, it is what it is and we rarely hear major complaints about it. Now let’s say it’s 2nd/3rd, tie game, bottom 9, 0 outs. Wild pitch, runner from 3rd comes home, is actually out but called safe on the field, and the catcher gets hurt. The other runner sees that, thinks the game is over and goes to celebrate (he basically goes from 2nd to 3rd then runs to the dugout to celebrate with teammates). Now if replay confirms the runner was out, the other baserunner may have, during the play, tried to score since the catcher was hurt and (let’s assume) the pitcher didn’t cover home plate. So the team on offense will argue that if the call is changed to an out, the runner from 2nd would have scored and not simply gone to 3rd. These “what-ifs” should not be allowed. A player should be awarded whatever base he occupied when the call was made. Here’s a different example with a different theory. Guy on 3rd, 1 out, fly ball to right, RF appears to make catch (ruled out on field), guy on 3rd had forgotten to tag up all the way, so goes back to 3rd, then comes home and is thrown out. Now, after replay, the call is changed to “no-catch”. Under that circumstance, the runner at third would not have had to go back to 3rd and would have scored. Should he still be ruled out? My answer is “yes”. The team that issues the challenge bears the risk of whatever else happened during the play, which could advantage OR disadvantage them. There’s no foolproof way to show that the runner would have definitely scored from 3rd if the play in RF was not ruled a catch, even though it’s fairly obvious. This is just like when a runner is held up at third on a ground-rule double. Is it entirely fair? No, but this is getting into a “what-if” discussion again, which we should avoid. Basically, on plays like this, whatever occurs as a result of the play, even if originally called incorrectly, should continue. The other player should be awarded the closest base unless he was “out” during the play (see below). In this tag-up example, the team on offense is somewhat screwed out of a run, but they still have a runner on first (awarded nearest base on incorrect call, so hitter should be on first) instead of NOBODY on base with one extra out. Isn’t this better, albeit slightly, and more fair than if BOTH outs were permitted? One last example (I know, reallly long, but I’m trying to cover all the bases). Runners at 1st and 3rd, two outs, bottom 9. Guy tries to steal second, catcher throws to 2nd, out called before runner from 3rd scores, inning over. However, review shows he’s really SAFE at second? Should winning run be granted? YES, BUT ONLY IF he was more than halfway home when the play occurred at second (nearest base). Is my proposal perfect? Of course not, and I’m sure I’ve missed other dilemmas, and I’m happy to hear them. I’m just trying to make an imperfect system improved to the greatest extent possible. I think this does it. I don’t think you really addressed the example I provided. What’s more, your examples further illustrate how dependent the action in baseball is on the umpires’ rulings. The only way to deal with this problem would be to bring even more human judgment into the equation, which, of course, increases the chances for error. About the only way I can see instant replay being effective is if it is used only in cases when there is no other dependent action (like ground rule doubles, for example, or a force out that ends an inning….but only from safe to out and not out to safe). Because of these limitations, I think baseball is better off with out it. Furthermore, you have to address the issue that MLB games are often only televised by local stations, not major networks as in the NFL. That means the technology used is going to vary. Therefore, stations like YES, which spend a lot of money on multiple cameras and enhanced technology, will wind up capturing more visual evidence than other stations. Furthermore, because the local networks are often controlled by teams, it introduces the possibility of manipulation (I can see an owner telling his RSN that they’d better not uncover visual evidence that helps over turn a call). Beyond these issues, there are many others that make replay in baseball very sketchy. Even if adopted in limited form, it needs to be done so very carefully.